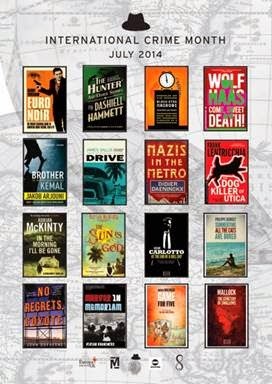 Leading independent publishers Serpent’s Tail, Melville House, Europa Editions and No Exit Press get together to bring you International Crime Month, a celebration of one of the most vital and socially significant fiction genres of our time. The launch event will take place at Waterstones’ Piccadilly on the 9th of July at 7pm. Authors Mallock (Europa) and Adrian McKinty (Serpent’s Tail) will discuss their writing with Barry Forshaw, author of Euro Noir (No Exit Press) and one of the country's foremost authorities on crime fiction, and with Serpent’s Tail founder Pete Ayrton. Join them for a glass of wine and a unique opportunity to meet some of Europe’s most twisted criminal masterminds…. More info on Waterstones' website. The event is free but places are limited: please reserve your place in store, via 020 785 12400 or email piccadilly@waterstones.com.